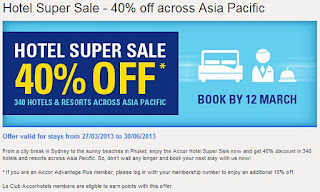 40% discount at selected properties across the Asia Pacific region, valid for stays between 27 March and 30 June 2013 (when booked until 12 March 2013). We test-tried the deal: 2 nights during the first week-end in April 2013 at the Mercure Sydney Potts Point have a total price of 177€, while the same room costs 239€ from booking.com. Thus, you get a 20% discount off the booking.com price (or a 40% discount off the standard rate, which was already 20% discounted on booking.com). The reservations with this offer cannot be cancelled, so book only if you are sure of your trip dates. Deal seen first on LoyaltyLobby.